Metryq wrote: ...if anyone more knowledgeable in computer systems used on space probes could explain this in more detail, I'm curious how this planned-for situation could be allowed to happen in the first place. That is, I realize the computer on a deep space probe has many limitations in power and other system resources—especially when all of it must be designed to function for years. Back to the question: if the probe was designed to default to Safe Mode in this situation, it dumps both the incoming instructions, as well as the job being executed at the time. Why didn't the system give one task priority and, say, bounce back a message, "Sorry, I was busy at the time. Please repeat your message." My area is more navigation software for airplanes so I can't speak authoritatively but I can toss a few vaguely educated ideas out there. Each processor in a computer can only do one thing at a time. In order to "do multiple things at once", a snapshot of the current task is stored and the processor can work on a separate task and then reload the previous task at a later point (vast simplification but meh). I would have expected something similar to what you suggest, when busy compressing and receiving a request for other intensive actions the probe would just say come back later. One possible reason why this isn't happening is the probe has both hardware limitations and must run fully autonomously. If the probe locks up you can't send perform a power reset. If the resources used for compressing data overlap with those used to process commands, then the safe thing may be to just dump everything and reset to a safe condition. I suspect this was just lack of detail in reporting. I would think the actual issue was the software hit a corner case condition not covered during testing which led to a conflict between different operations and the software took the safe route of dropping to a safe state (similar to a windows blue screen). This kind of thing can happen in aviation software even with the amount of testing we do (in theory we test every branch). Space probe testing is good but I suspect it is not quite as intense as aviation. Dotini wrote: It will have dissimilar hemispheres. Its strange that pluto is so small, yet has so many moons. A good point about the elliptical orbit. I was thinking is pluto too far away from the sun to be electrically active, but it is moving up and down the electrical field significantly, so it makes sense that it should be subjected in some way to electrical flows. Nice, the 'ole hex crater pops up to say hi. Ionized Nitrogen was found five days ago! That means that the Plutonian atmosphere is much larger than thought. Me thinks this points more towards a cometlike behaviour with a tail taking into consideration the extreme elliptical orbit of Pluto. During perihelion, Pluto is only about 30 AU from the sun, closer than to its neighbor, Neptune. During aphelion, Pluto is about 50 AU from the sun. Yeah, this was added to an arstechnica article. Just a corner case that never got tested because hard to detect means almost impossible to test. "Update, 10pm ET: NASA has announced that "There was no hardware or software fault. The underlying cause was a hard-to-detect timing flaw in the spacecraft command sequence that occurred during an operation to prepare for flyby." Science operations are set to resume on July 7." 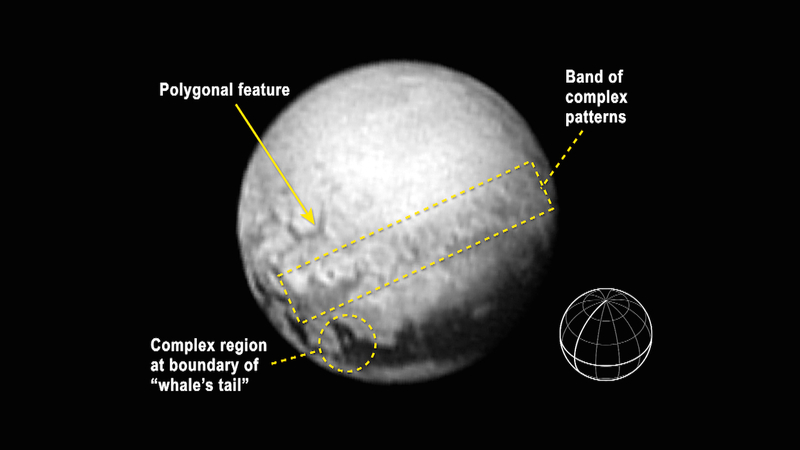 Given the mainstream paradigm for solar system formation, how could Pluto display any type of activity whatsoever? should it not be frozen and inactive? nick c wrote: Given the mainstream paradigm for solar system formation, how could Pluto display any type of activity whatsoever? should it not be frozen and inactive? No, they do expect interaction. First with the solar UV and if ionisation occurs also with the solar wind, the craft will hopefully also get some aurora data, at least they expect it. Also i think they are already measuring atmosphere, pluto has a large one it seems, seems like comet behaviour. That's awesome! 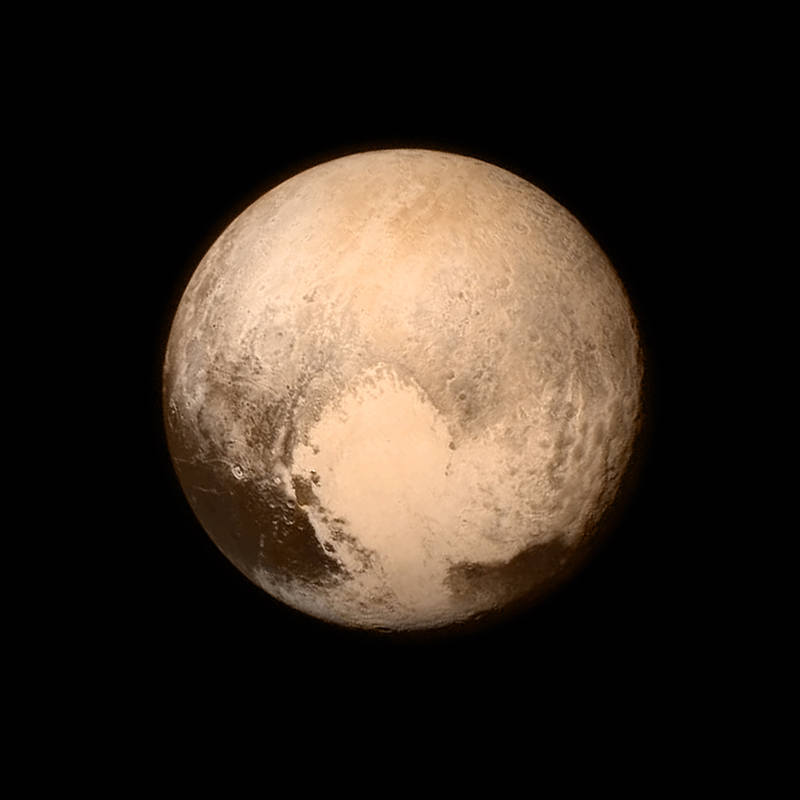 We finally know what Pluto looks like (on one side). And the hexagonal crater is in full view! Does the relative lack of craters in the light area on Pluto's lower hemisphere imply this area is active? Could the dark areas be hydrocarbons? These are my personal views, not necessarily reflecting those of other Thunderbolts members, although they might be similar. The European Southern Observatory did an analysis of the surface ices on Pluto and determined that there's a strong methane signature in Pluto's spectrogram from 1 to 5 μm. So far, no details from Alice onboard New Horizons. I suspect that Pluto is going to have atmospheric constituents that are similar to one of the gas giants (minus the free hydrogen and helium). Nitrogen is "leaking" into space, as the ionized nuclei demonstrate, so it remains to see what the percentages of each there are. Since Pluto is reddish, as are other moons, Centaur objects and KBOs, then its surface might be dusted with tholins. I think that Pluto is indicative of other celestial objects in the Solar System: they are all returning to equilibrium after experiencing catastrophic events a short time ago (in cosmic reasoning). That includes the Sun. I don't think that there are new catastrophes in store, at least in the near future. Rather than gearing up for another round of energy input, the Solar System is oscillating on a downward curve. I expect that things will become calmer soon. So, to answer your question more directly, I would say no. Pluto and Charon saw their activity most likely around the same time as the rest of the Solar System. In fact, I was remarking to a colleague that Charon reminds me of Neptune's moon, Ariel and I propose in my Picture of the Day article that it is an electrically scarred worldlet. Dotini wrote: Could the dark areas be hydrocarbons?